Often, young people who have just been diagnosed with OCD—or are dealing with a flare-up—”go home again” and move in with family to regroup. My strong opinion is that this isn’t a good idea. Going home again can often undo the progress that you’ve made in your life, such as having a good job, having a nice apartment, having a social circle. When you go home again, you risk dismantling your life. More crucially, going home again usually allows OCD to fester. Brush up on OCD basics. Please don’t leave your job. Instead, have a conversation with your boss about what’s going on and that you may need time to go to doctor’s appointments. You can say you’re struggling with a health problem (that’s true—it’s just your brain wiring misfiring) and it’s personal. Legally, your boss can’t ask, “What is it?” If she persists and you don’t want to tell her, you can say, “I’m struggling with a common mental health issue and I’m getting help. I would appreciate having some flexibility in my schedule in the coming months.” Propose strategies you’d like to put into place so you can keep working while you work on you. Your boss probably really likes you. Or at the very least, your boss wants to keep you. Replacing employees, or figuring out staffing needs while an employee takes medical leave, is an extremely expensive aspect of running a business. It’s likely that your boss will want to work with you on this. If you’re scared of this conversation, don’t be. If you were considering “going home again,” that means you were probably considering leaving your job anyway! So, say what you need to say. Also, tell your boss that you want to have an open dialogue: encourage her to tell you if she senses your performance is flagging at any point, so you’re aware of it, and so you can make adjustments. (Then you don’t have to worry about it. If there’s a problem with your performance, someone will tell you). Reframe the way you think about work. 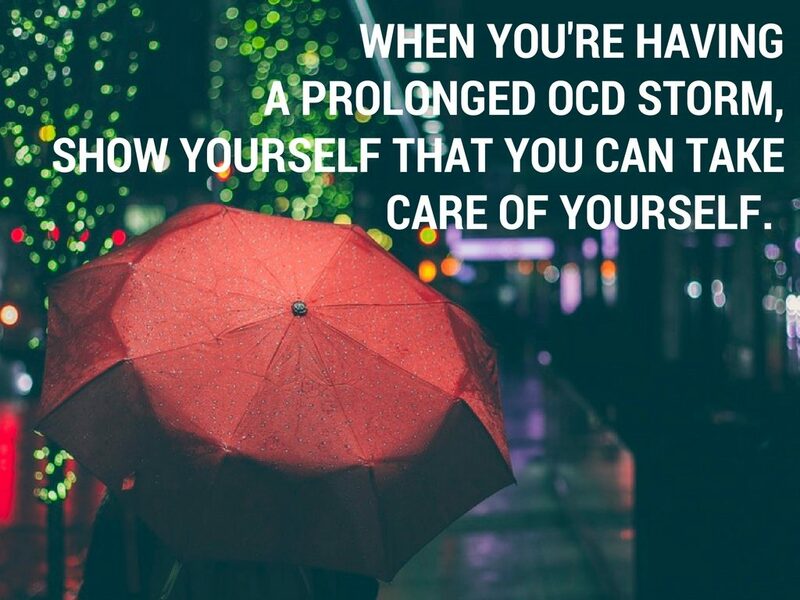 Frequently, OCD thoughts and fears revolve around the home: fear of leaving the water running, fear of someone messing with the way the contents of your room (or the refrigerator) are perfectly arranged, fear of not flushing the toilet, etc. You could even be struggling with irrational, looping thoughts about your roommates “catching you” performing a ritual or acting strangely. Find a place where you can be fully, completely comfortable. An easy option is your bedroom (especially if you have your own room). Buy a few things to make this space comfortable, like a soft blanket, attractive art for the walls, or a new pillow. Consider other places where you can easily go to feel safe. Make a list of places that can be your “happy place.” This could be your favorite grassy spot in the park, your favorite chair in your local coffee shop, your favorite elliptical at the gym, or your favorite nook in the library or the bookstore. When you feel like curling up into a frightened, anxious ball, know there’s a place where you can safely uncurl and spread out, cuing your brain into feeling totally at ease. Whatever you do, just keep living your life. When your OCD flares up, instead of dismantling your life, focus on building your life. Instead of taking shelter, show yourself that you have the strength to handle the storm. - Sivan Cohen, LMSW, CASAC-T, New York, New York.